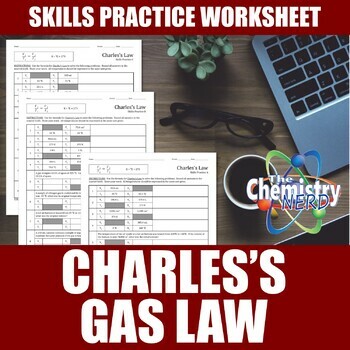 This set of three Skills Practice sheets is a great tool for helping your students master the concepts of Charles's law. Each sheet includes four simple, numbers-only problems in which the students simply practice the skill of formula math. Each sheet also includes four word problems that strengthen a students ability to pull information from a prompt. You receive all three printable worksheets in PDF format, the answer keys, as well as access to the original, editable Google Doc. Printable PDF—Included in your packet is a printable PDF. 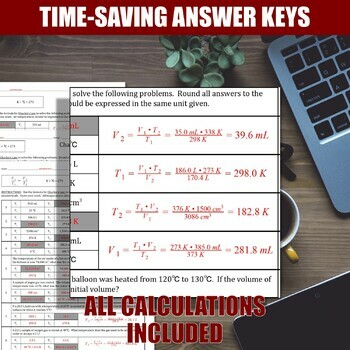 It includes the three Skills Practice sheets and the answer keys for each. These are ready to print and hand out to your students so they can practice the skills of calculating the relationship between pressure and volume described in Charles's Law. Print one or all three depending on your students needs. Google Docs—In addition to the print version, your purchase grants you access to the original, editable document created in Google Docs. If you want to make changes, remove the Checksum, or use them for digital assignments. 1:1 Classroom Enhanced—Assign the Google Doc through Google Classroom and your students can complete their practice right on their own computer. Self-Checking Checksum—Whether you decide to print the Skills Practice sheets or make them a digital assignment, the checksum allows students to easily confirm they have complete all calculations accurately. To assess only the students skills at using the formula for Charles's law, students must round all answers to the tenths place. In some cases, this ignores the rules of significant figures, but allows the checksum to assess only the one skill. Answer Sheets—Your time is valuable. Included with each Skills Practice Sheet is an answer key with all work shown. I’ve used these sheets in my own class and have tried to eliminate any errors. However, should you find a mistake, please let me know so that I can correct the master file.